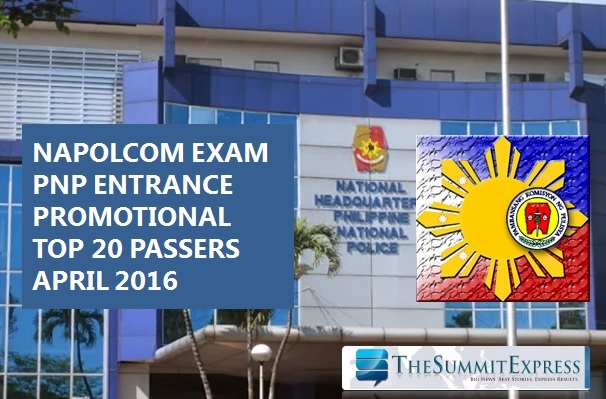 MANILA, Philippines - The National Police Commission (NAPOLCOM) has released today, June 24 the complete list of passers for April 2016 PNP Entrance and promotional examinations. The top 20 passers or topnotchers per category were recognized by the agency. Winston Saflor Parre and Junah Bawit Salvador tied to get the top spot for PNP Entrance exam, 81.66-percent grade. Cyril Lawrence Balgos garnered the highest place for Superintendent promotional exam as he got 81.66-percent score. Lyndon Tobes Dagalea received the highest mark for Police Inspector exam, 85.44-percent grade. Meanwhile, Marjorie Maglana Cericon topped the Police Officer, 84.80, and Heraclio Jamero Vargas led the Senior Police Officer examination with 86.00-percent grade.